In a move that is expected to make it easier for advertisers, agencies and their suppliers to measure, account for and compare video ads distributed across platforms from TV to smartphones, the Media Rating Council today released a draft of its cross-media audience measurement standards. The draft, which will be open for public comment for 60 days before becoming finalized, punts an important and somewhat controversial aspect of the new standards -- duration weighting -- until 2021 to allow the industry time to adjust to the transition. The draft also sets a new bar for so-called “viewability,” requiring that 100% of the the pixels need to be in view for a video ad to be credited, regardless of the platform it is distributed on. Another significant development in the proposed standards is that they make 30 seconds the “denominator” for calculating the duration weighted viewable impressions when they become the standard in 2021. While 30 seconds has long been the standard advertising unit for television, MRC President and Executive Director George Ivie said the 30-second denominator wasn’t established for that reason explicitly, but because most of the systems the supply and demand sides use to process advertising buys currently use it as their standard duration. He said the MRC will continue to watch how the marketplace evolves between now and 2021, keeping a particular eye on how the marketplace moves toward new standards of video ad durations, and he implied that denominator could be changed in the future. He also challenged that the duration weighted impression was mostly opposed by certain parts of the supply chain -- especially digital video sales organizations, noting that most of the comments the MRC received for delaying it came from the demand side, and it was mostly because those media buyers and advertisers felt they wouldn’t have their systems in place to move to duration weighting for some time. That said, the concept has been the subject of debate, because it creates an even accounting method for crediting all durations of video ad impressions, regardless of their length. While some opponents have resisted it on the grounds that it might favor a medium where consumers are more likely to sit through longer-form video ads to completion, Ivie said it simply is accounting for the duration of the video that was watched, not the value that buyers and sellers allocate to it. Simply put, a 30-second spot would only get 100% credit when all 30 seconds are watched, and a 15-second spot would only get 100% credit when all 15 seconds are watched. But video ads that are only viewed partly through would receive that proportion of credit based on the percentage that was viewed. Ivie asserted this is the fairest and most efficient way to assign credit for video ad impressions regardless of length or duration viewed, and that it simply is an accounting standard. He said it would be up to the marketplace to determine what the value of those durations and weighted durations are. Historically, the ad industry has spent a significant amount of time and attention debating the relative value of shorter-form ad units, whether it was the migration of :60s to :30s, :30s to :15s, or the current deployment of :06s. Ivie did add that one of the next big areas of focus for the MRC would be to get involved with what he described as “outcome-based metrics,” things like “brand lift,” “sales lift,” and “ROI, that can be associated with impression metrics," but that it is a separate process. With the duration weighted metric deferred until 2021, the most significant change in the new proposed cross-media standards is the shift to 100% pixels, because both digital video and static digital ads currently require only 50% or more of their pixels to be in view to be credited. Ivie said the MRC has heard from people on both sides that the council should consider adopting 100% viewable standards for digital video and banner ads too. He encouraged industry participants to come forward with their comments in the next 60 days, and assuming no further changes are adopted, the draft will become the new standard for cross-media ad measurement, including the duration weighted impressions in 2021. 9 comments about "MRC Proposes 100% Viewable Cross-Media Ad Standard, Defers Duration Weighting Until 2021". Jack Wakshlag from Media Strategy, Research & Analytics, March 25, 2019 at 11:16 a.m. There is a reason George Ivie and his group at the MRC have been the arbiters of the industry for so long. Based on this summary, they have laid out a sound plan for the future of cross media reporting. Tje industry We owe them a timely response to their plan, and gratitude for the role they play. Thanks to George and the MRC. Ed Papazian from Media Dynamics Inc, March 25, 2019 at 12:28 p.m. Agreed, Jack. This is the first realistic move in the direction of getting some degree of comparability between platforms---TV and digital video----and has been a long time getting here. But, lest we sit back and think that all has been solved, let's remember that we do not have an ongoing measurement that tells us who, if anyone was "watching" the commecials for either TV or digital. Sigh! Jack Wakshlag from Media Strategy, Research & Analytics replied, March 25, 2019 at 1:24 p.m. Thank you Ed. Do we not have PPM metrics for TV that could be used at the ad level? I agree that device level measures on their own will not do. Tony Jarvis from Olympic Media Consultancy, March 25, 2019 at 1:39 p.m. So correct, Ed. It appears that too many in our industry conveniently confuse "viewability", a fundamental "proof of performance" measure and to your point, with truly measured "watched" or "viewed" - a confirmation of actual expsoure by the brand's target group. ("Contact" as used and measured by most OOH media worldwide.) While duration (or size) will certainly effect the probaility of contact or exposure, an ad unit can only have an "impact" (a measured value or brand outcome) for the advertiser driven by many factors beyond media measurment if "viewed" or "watched" whatever the ad duration or ad size. Agreed Jack, MRC are to be complemented on their move to 100% "viewability" as the Standard. However, in support of Ed's position, duration weighting does not get us to where advertisers and their agencies really need to be. 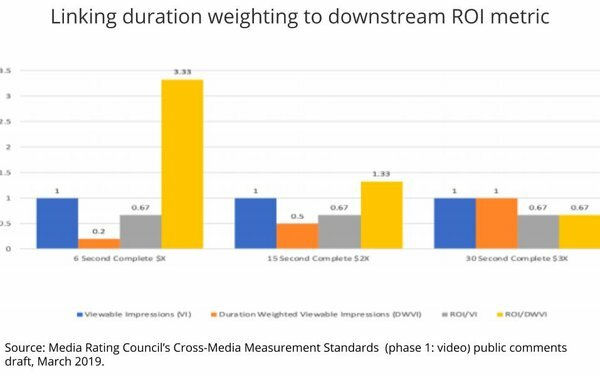 Joe Mandese from MediaPost, March 25, 2019 at 1:54 p.m.
@Ed, Jack & Tony: The duration weighted measurment metric is an accounting method for crediting the share of a video ad unit that was viewed. It is NOT a measurement method. The MRC would continue to work with measurement services to audit and accredit their methods. Additionally, the MRC is beginning the process of creating standards for "outcome metrics" that would be used for services seeking to measure higher order functions (beyond exposure), such as brand lift, sales lift, etc. Ed Papazian from Media Dynamics Inc, March 25, 2019 at 2:34 p.m.
Jack, the PPMs merely assume that the person wearing or carrying the device is "watching", or "listening" in the case of audio, when the audio signal from a particular channel is "heard" by the device. They pose exactly the same problem as the Nielsen Peoplemeters, though, at least, the latter ask panel mambers to signify whether they are "watching" the program tuned to when the set is activated or the channel is changed. Ed Papazian from Media Dynamics Inc, March 25, 2019 at 2:38 p.m.
Joe, I believe that Jack, Tony and I are noting the sad fact that most users of the audience data---time buyers, time sellers, others---- have no idea what the numbers actually represent, hence they will assume that commercial "audience" is being measured. As a result, many will mistakenly think that "the comparability problem" has been solved and use the weighted figures as if they really repesent commercial "audience". What we are saying is ---not necessarily, folks. It's a beginning---and a welcome one---but not the end of the story. Marilois Snowman from Mediastruction replied, March 26, 2019 at 9:55 a.m. I am confused about the pragmatic use of this metric, if it isn't measuring audiences. If it isn't measuring audiences, can it be used for ratings? posting? negotiation? Followup question: Why would we skip over measuring audiences in favor of outcome metrics? Thanks for POV, @Ed, Jack & Tony. Joe Mandese from MediaPost, March 26, 2019 at 10:06 a.m.
@Marilois Snowman: If you mean duration weighting, it's just an accounting method used to assign how much of an ad impression a viewer was exposed to so those impressions can be compared across platforms: TV, web, mobile, etc. As the expert commentators have pointed out here, exposure is not the same thing as actually watching something. That's up to audience measurement services and their methods, and these experts suggest those methods are still lacking.